Breanna Collins in the CTI Lobby. Photo by Katie Harris. Breanna Collins is the Online and Distance Education (ODE) scheduling officer for DELTA and the only one on campus responsible for scheduling ODE courses. Collins was born in Raleigh, North Carolina, at UNC Rex Hospital. Her family moved around, but she found herself back in Raleigh to attend NC State as an undergraduate student. She graduated with a bachelor’s in psychology in 2013. Currently, she is enrolled in NC State’s online Youth, Family and Community Sciences master’s program. 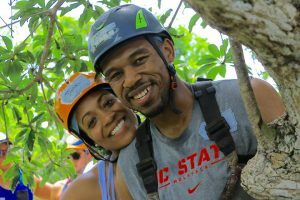 Breanna Collins and her husband, Brad, enjoyed a zip line excursion in the forest of Selvatica during their honeymoon in Cancùn, Mexico. She met her husband, Brad, as an undergrad at NC State. They got married in 2016 at The Farm in Selma, North Carolina. Before coming to DELTA, Collins was a nanny and worked with at-risk youth in Durham, North Carolina. In 2014, she started at DELTA as a temp worker. Her past positions were centered around young children, so moving into higher education was a new experience for Collins. She later moved into a full-time testing associate position and was promoted to ODE scheduling officer in 2016. Collins has completed the Pathways Leadership Development Program, designed to improve one’s interpersonal communication and leadership skills. She has also received a Citizen’s Police Academy certificate for completion of a series of classes held by the NC State University Police Department that give community members a better understanding of law enforcement practices. Collins recently led the creation of the administration section in Testing Services’ standard operating procedures manual. Another project she worked on was creating the Accomplice to Professional Betterment (APB) accolades that give people opportunities to speak about other staff in a positive light. “I use data and information collected from previous and current semesters to set up our online courses for current and prospective students,” said Collins. She collects data for the Associate Vice Provost of ODE Tim Petty and Director of ODE Administrative Services Melissa Williford. Collins also schedules and enrolls students. “I schedule all DE courses via the Student Information System (SIS) and the scheduling tool created by Jonathan Champ,” said Collins. 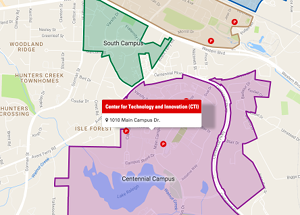 “The scheduling tool allows scheduling officers from different departments to submit the details of their course requests to me.” Collins also uses queries to keep track of important information regarding courses. What team do you work closely with? Collins is part of the ODE administrative team, consisting of Williford and University Program Specialist Tamara Watts and Faculty, Student and Program Specialist Allison Harrison. There are only about a dozen people in her office, making it a close-knit community. “Even though we do different things we are all in the same space and work together. It is kind of like our own little island,” said Collins. 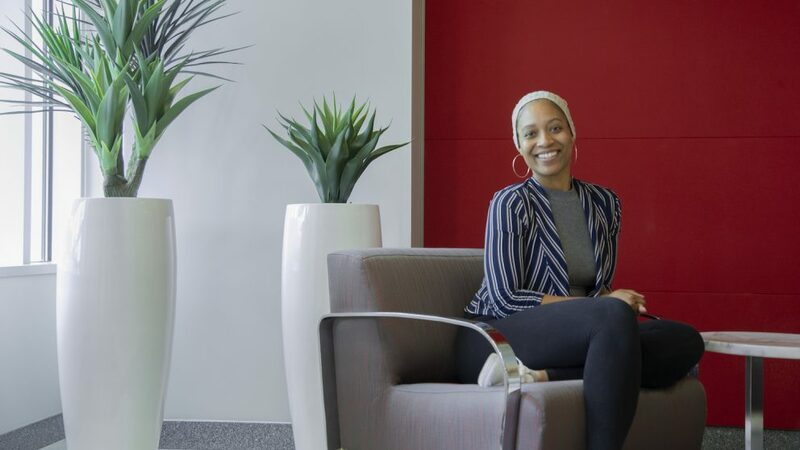 In her time here at DELTA, Collins is also impressed by how her coworkers continue to push themselves to take on more responsibilities. “It sets the bar high,” said Collins. One of Collins’ favorite pastimes is watching movies. She loves horror, suspense and psychological thriller films. She also enjoys going to the movie theater, but mostly for the popcorn. Collins would rather buy popcorn at the theater then leave to watch a movie at home. Breanna Collins’ American bulldog named Beau. Collins shared some of her greatest fears. She is terrified of snakes and has slight trypophobia, the fear of clusters of small holes. 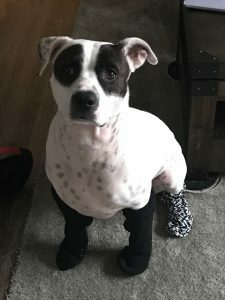 Her four-year-old American bulldog named Beau also has some unique phobias. “Beau is really sweet, but he is terrified of absolutely everything,” said Collins. Strangers and things like ceiling fans and cardboard boxes easily frighten him. “Sometimes I am like, ‘my poor baby,’ but other times I am like, ‘come on son, you need to put your big boy boots on now, it’s just a ceiling fan,’” she joked.